The day after Thanksgiving, shoppers were filled with turkey and ready to move forward with their post-food coma tradition: Black Friday shopping. In the past, people would leave home before dawn and wait in endless lines to get the best deals. Crowds, hecticness, and everything you would typically hate when shopping on a busy day, are accepted this one day a year. With the great success of Cyber Monday, it’s no surprise people have been opting out of the crowds and opting in for shopping from home comfortably in their pajamas these past few years, and stores are finally catching on. This Black Friday, online sales exceeded $3 billion, and a little over $1 billion of that was purchased on mobile devices. Black Friday isn’t the only day online sales are expected to increase this season; Adobe is predicting online sales to hit at least $1 billion just about every day this holiday season. So, what does this mean for your ECommerce business? With online sales increasing more every year during the holiday season, online retailers will look to take advantage by acquiring more traffic to their websites and converting more sales. We’ve made a list of tips to help your business grow stronger, and to improve sales, during this holiday shopping season! Driving traffic to an online store is key during the holiday season. Search engines such as Google, Yahoo, and Bing attract users actively searching for goods and services. The key word here is “actively” because unlike an ad you might see on TV, you know that there’s a specific interest and often “ready to buy” attitude associated with these consumers. Search engine marketing is powerful all year long but for the holidays, there are additional sales opportunities. Most of the year, the majority of traffic you will receive to your online store will consist of people shopping for themselves, but during the holiday season, you may have the opportunity to receive shoppers who are outside of your typical target audience looking for gifts. Businesses looking to spend untapped budgets often look to spend more online during this time too. So, to take advantage of the holidays, we’re most concerned with where your website ranks on a search engine results page (we call it a “SERP”) and secondly with the corresponding text. The first way to affect and therefore increase your search engine rank is by purchasing PPC (pay-per-click) ads for your biggest sales and most wanted items. By running a PPC ad campaign, you are able to target consumers based on what they search for, and you pay only when the advertisement is actually clicked on. We recommend starting with Google AdWords for PPC advertising. Google has the most widely used search engine therefore providing your ads the opportunity for the most viewers. 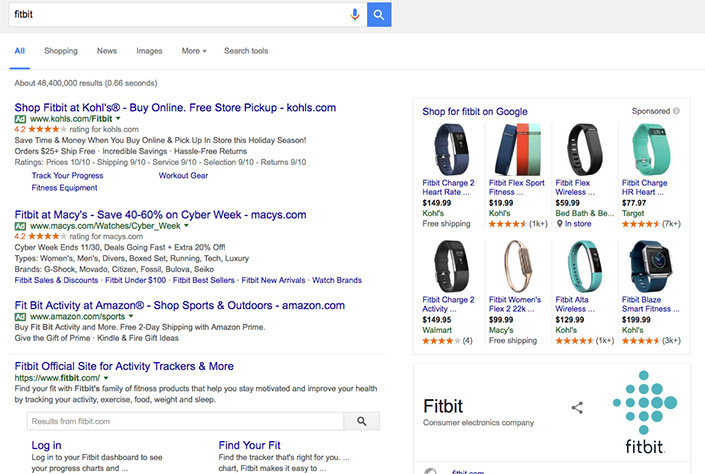 Promoting your holiday sales with PPC advertisements will allow your business to be displayed on the first page of the SERP quickly too. Ads begin to be displayed within minutes of setting up a campaign. Another method to help guide more traffic to your website is SEO or Search Engine Optimization. This is a process that takes much more time but will increase your chance of showing up organically on search engines. Organically means that your position is decided on by Google and is not a result of advertising. These show up below PPC ads and are of higher value than ads. For instance, some searchers actually prefer to skip PPC ads and rely solely on organic results. Also unlike PPC ads, the organic results on a SERP remain whereas PPC ads disappear if the campaign is paused or ends. We could go on and on about SEO… which we do in other articles that you can find here. It’s important to understand that the average consumer will not move beyond the first page of search engine results, so where you rank matters. PPC and SEO are essential this holiday season to market your business through search engines. Social media can be valuable in many ways for your marketing during the holidays. With the right strategy for your social media marketing you can grow your brand awareness and customer engagement, drive more traffic to your website, increase conversions, and overall continue to grow your ECommerce business. Facebook can be one of the most effective social channels for promoting products online. Social media marketing is about building relationships first and selling second. This simply means you should focus on sharing helpful information about your product and establishing trust with your fans through authentic content. To start, a business might begin sharing holiday inspired content or promotions in November to work on connecting with customers. Try a promotional contest that engages customers to share your product or info. Monitoring your posts on a daily basis responding to comments, thanking fans for sharing content, and participating in discussion are all essential for interacting with fans, building trust, and increasing brand awareness. Twitter is another adaptable social site any ECommerce business can use to increase sales and promote themselves amongst their fans. There is a good chance if your Twitter followers like what you have to share, then they will re-tweet your post displaying your message to their own followers increasing your brand awareness. Your Twitter posts should be short and sweet and should incorporate hashtags, which will organize your content across the Twitter network expanding the reach of your posts and therefore adding to the likelihood of customer engagement. Instagram is one more social channel that ECOmmerce businesses can take advantage of. The format of Instagram is posts of visually pleasing photography but this doesn’t limit usage to fashion and food brands but does require an extra level of creativity. Looking for something more aggressive? Social Networking websites like Facebook, Twitter, and Instagram also have paid advertising options available. Add to your social media strategy with sponsored content like Facebook & Instagram ads, or Promoted Tweets connecting customers to your desired product page. The targeting options available with social platforms have the potential to be highly targeted, meaning these types of paid promotions can dramatically boost traffic to your online store. During the holiday season it’s likely that your inbox is full of email from brands telling you about their awesome sales, extended store hours, and more. To many, an email might come off as a bit old school or a nuisance in terms of marketing in the online world, but it can still be a tried and true way to build awareness of your holiday deals to new and existing customers. If someone has provided you their email either from a past purchase or newsletter sign up, they’re already interested in what your business has to offer. Knowing this and crafting well thought out promotional emails during the holidays could potentially result in more sales. Over time, this contact list will continue to grow with increased subscriptions and customer purchases. Organizing contacts in a Customer Relationship Management system (or CRM), can allow for even more personalized emails based on past purchases or other segmentation of your customers. 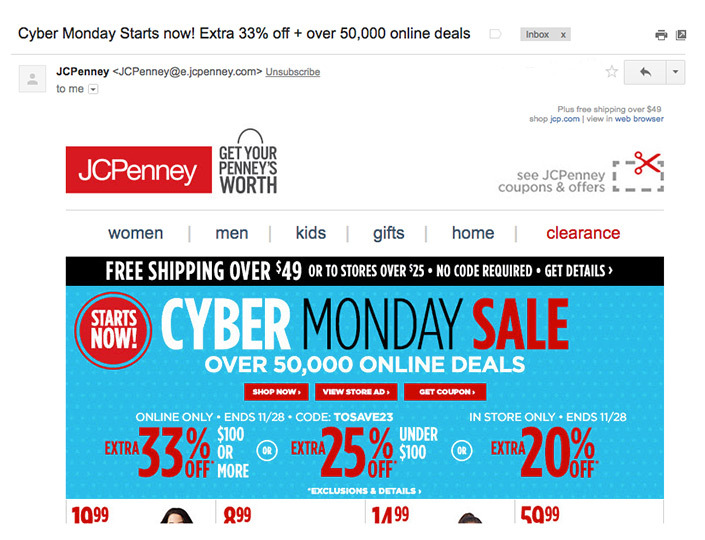 In addition to the email campaigns, every ECommerce store should be equipped with an abandoned cart automated email. A well-planned automated email reminder for customers who reached the final stages of checkout without finalizing a purchase can help lower your stores shopping cart abandonment rate and entice those customers to complete their purchase. Whether you have heard of remarketing or not, we’ve all experienced the process while shopping online. Can you think of a time when you were on a brand’s website browsing a specific item, then shortly after you begin seeing that product in advertising around the web? You were constantly reminded of your interest probably of that specific product and always from that specific website. This is remarketing. Remarketing can be a strategic component of your holiday advertising. Ads can be shown to people who’ve visited your website or used your mobile app. There are several formats available in remarketing including text ads, images, and video. The large-scale reach of AdWords can target the visitors in your remarketing lists across multiple devices (PC, Mobile, & Tablet) as they browse over any of the 2 million websites and mobile apps registered with Google’s display network. Using the remarketing features Google AdWords provides, for example, is the quickest way to deliver relevant ads to the customers visiting and leaving your website. Can your website handle holiday traffic? Is it secure? How does it look on mobile? These are important aspects of your digital marketing as well and should be frequently monitored throughout the holiday shopping season. With an increase of traffic during the holiday season, you should ensure your site will not crash, and that your pages are secure. You can use the free tool Google Analytics to understand the traffic that is visiting your website. Additionally, you can talk to your website hosting company or us at Square 205 if you have any questions or concerns about your site’s traffic capabilities or security. Another thing to keep in mind when reviewing your website for this busy time of year, is your shipping and return policy. Is it up to date? Do you change either of these for the holidays? Let Us Help Improve Your Sales! Do the holidays have you thinking about how you can improve your ECommerce sales? Contact us! Our team can hand pick an ECommerce solution that fits your business’ needs while providing you with a marketing plan to grow your sales.